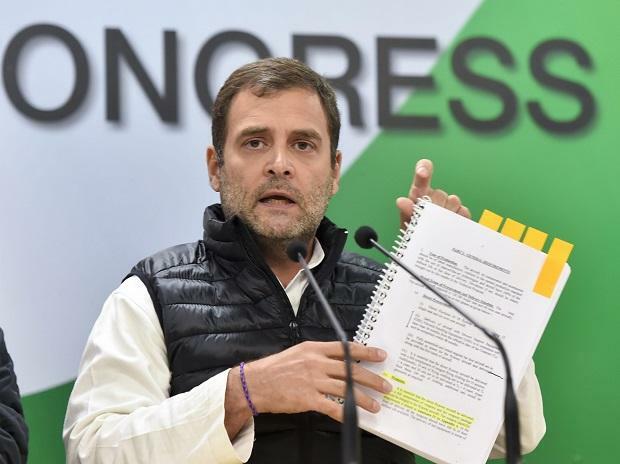 Armed with an audio clip, containing purported conversation between a Goa minister and a journalist, Congress president Rahul Gandhi launched a fresh attack on the Narendra Modi government on the issue. Goa Chief Minister Manohar Parrikar and Finance Minister Arun Jaitley termed the audio clip as fabricated. Jaitley said the Congress president had made it a habit of manufacturing lies and spreading falsehoods. He asked Gandhi to authenticate the audio clip, and cautioned that the Congress leader might have to face a privilege motion and even expulsion if it turned out fabricated. The Congress leader maintained the clip was genuine and challenged Prime Minister Narendra Modi for a one-on-one debate on strategic issues. The Congress, other opposition parties, and even Bharatiya Janata Party (BJP) ally Shiv Sena persisted with their demand that the government order a joint parliamentary committee, or JPC, probe, into the Rafale deal. Gandhi, first in the Lok Sabha during a discussion on the issue under Rule 193 of the House, and later at a press conference at his party’s headquarters here, said the Modi government followed a questionable process in selecting Rafale jets, that it purchased them at inflated prices, and accused the PM of favouring industrialist Anil Ambani. In the morning, the Congress released the audio clip of a purported conversation between Goa Health Minister Vishwajit Rane and another person. In the recording, the person identified as Rane said that during a Cabinet meeting last week, Parrikar had told his colleagues he had "an entire file" on the Rafale deal lying in his bedroom, which could prove to be embarrassing for the BJP leadership. Both Parrikar and Rane later denied this. “The audio clip released by the Congress party is a desperate attempt to fabricate facts after their lies were exposed by the recent Supreme Court verdict on Rafale. No such discussion ever came up during Cabinet or any other meeting,” Parrikar tweeted. The Congress party’s Goa unit demanded a search of Parrikar’s residence. Parrikar was defence minister when the PM had travelled to France in April 2015 and signed the deal. In its December 14 order, the Supreme Court had given a clean chit to the Modi government’s decision-making process in selecting Rafale fighter jets for the Indian Air Force. However, Gandhi argued the Supreme Court order did not say that there was no corruption in the deal. He said Parrikar was "effectively blackmailing" the PM on the Rafale issue. Gandhi said Jaitley in its reply in Parliament conceded that the Modi government bought Rafale fighter jets at an inflated price, and said a future Congress government would order a probe into the deal. In the Lok Sabha, Jaitley hit back, accusing Gandhi of having a "legacy of lying" and "repeating falsehood", and alleged that "conspirators" of past defence scams were now raising fingers at others. He said the Supreme Court had already satisfied its "conscience" on the issue and there was no need for a JPC probe. His speech was disrupted by continuous protests from the Congress Members, some of whom were seen throwing paper planes, drawing the Speaker's admonition. Jaitley said the Congress felt that since "its hands are already soaked in corruption", it decided to "manufacture" a lie to defame the Modi government which has a clean record. "Remember the JPC on Bofors ... it said the kickback were winding up charges ... it whitewashed corruption," Jaitley said. He also claimed that the JPC is a partisan body which cannot investigate fairly. He said there was no point in accepting demand for a JPC by a party which is already embroiled in Bofors corruption case. The FM said the price of 'bare aircraft' had been revealed and that the price of 'weaponised' version cannot be told as it would help India's adversaries. He reiterated that the bare aircraft was nine per cent cheaper than the one negotiated by the UPA and the weaponised version was 20 per cent cheaper.